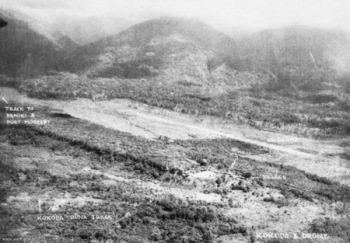 Kokoda (147.731E 8.887S) was the site of a small grass airstrip in a valley extending deep into the northern foothills of the Owen Stanley Mountains of New Guinea. Kokoda was also the head of the Kokoda Trail, a primitive track leading over the Owen Stanleys to Port Moresby. The Kokoda Trail was 145 miles (233 km) long and, in many places, only wide enough for one man. It reached a maximum elevation of 7500 feet (2290 meters) and in some places, such as the derisively named "Golden Stairs", was log steps laid in the mud. Only folks as fanatically determined as the Japanese Army would have tried to pull logistics over the Kokoda Trail. The Allies used coastal luggers and transport aircraft to supply their Buna campaign. The village itself was located on a low plateau southwest of the Mambare River, along with a coconut plantation. A grassy airstrip was located on level ground below the village. The Kokoda campaign began with a serious failure of Japanese intelligence following the Battle of the Coral Sea. The Japanese captured a book in Manila containing a vague, second-hand account of a road from Buna to Port Moresby. Aerial reconnaissance showed that there was a road from Buna to Kokoda that continued on to the edge of the thick jungle. Based on the vague references in the Manila book, Japanese intelligence concluded that the road continued on under the jungle canopy, a conclusion that was "confirmed" by a second aerial observer who thought he saw a serviceable road from Kokoda to Isurava. However, the observer was disoriented, was attempting to evade Allied fighter cover, and misjudged the width and condition of the trail. Based on this shaky intelligence, on 1 July 1942 Imperial General Headquarters ordered South Seas Detachment (Horii) to land a force near Buna on 21 July 1942 and secure a beachhead. The initial landings were to be carried out by Yokoyama Advance Party, a force of about 2000 engineers from 15 Independent Engineer Regiment covered by a battalion of infantry from 144 Regiment and a company of 1 Sasebo SNLF. Their orders were to advance to the foothills of the Owen Stanley Mountains and evaluate the road and river communications for their suitability for supporting an attack across the mountains. Horii himself was skeptical of the venture; his chief of staff had calculated that as many as 32,000 porters would be needed to support a combat force of 5000 men at the Port Moresby end of the Kokoda Trail. However, on 15 July 1942, LCOL Tsuji Masanobu arrived at 17 Army headquarters at Davao with orders for 17 Army (Hyakutake) to relocate to Rabaul and for South Seas Detachment to advance at once from Buna to Port Moresby, without waiting for the feasibility study. Just where Tsuji got his authority was unclear; he claimed Imperial sanction, but on 25 July a telegram from the Operations Section in Tokyo revealed that Imperial General Headquarters was still awaiting the results of the feasibility study before ordering an advance across the mountains. Tsuji had exceeded his instructions, which were to await the feasibility report at Davao and then join in making a decision. However, with elements of South Seas Detachment already landed and in combat with the Australians, Hyakutake feared losing face, and he reported that the advance on Port Moresby was feasible and the offensive should proceed. Prisoner of war interrogations suggesting that there were already 20,000 Australian troops at Port Moresby were ignored. Yokoyama Advance Party had carried out their landings on 21 July 1942 as scheduled, though Ayatosan Maru (9788 tons, 17.0 knots) was sunk by Allied aircraft and Ryoyo Maru (5974 tons, 11.5 knots) was forced to return to Rabaul before unloading its cargo of horses. The troops also brought hundreds of bicycles with them, which were quickly abandoned. Horii's troops began working their way up the Kokoda Trail the next day, making contact with Australian defenders from 39 Battalion on 23 July at Awala. Within four days, the defenders had been pushed back to Kokoda village. The town and airstrip fell on 29 July, leaving the Australians with no way to airlift reinforcements. The next two months saw the Japanese force, reinforced by the remainder of South Seas Detachment and 41 Regiment from Malaya, drive the Australians back over the Owen Stanley Mountains and to within 30 miles of Port Moresby. The Australians delayed the Japanese advance at Isurava for five crucial days before being driven back on 30 August. The senior Allied commanders then expected the Australians to make a stand at The Gap, the summit pass along the track, which they seemed to think was a narrow and easily defensible defile. In fact, The Gap is a broad depression in the summit ridge 7 miles (11 km) wide, and the Australians made no attempt to hold here. The Japanese crossed to the south slopes of the Owen Stanleys almost unopposed. Reinforced by two brigades from 7 Division, the Australians prepared to make their stand on Imita Ridge, the last geographical obstacle north of Port Moresby. However, by 7 September the Milne Bay invasion had failed, eliminating the other prong of the Japanese drive on Port Moresby, and by 14 September the Japanese drive along the Kokoda Trail had lost its momentum. The reverses at about the same time on Guadalcanal caused the Japanese High Command to order the troops to retreat back to the Owen Stanleys, dig in, and await developments. At first stupefied by the abandonment of all they had striven for, the soldiers had finally understood that the unimaginable was happening: Japanese soldiers were turning their backs on th enemy, running away. And with that insight came a changed mentality that Okada detected and would later describe: "They were seized with an instinctive desire to live. Neither history nor education had any meaning to them now. Discipline was completely forgotten. Each tried for his life to flee faster than his comrades, and the confusion was worse than it had been at the supply dump. During short respites on the way, we often repeated the popular Japanese saying, "Where there is life, there is hope." Conditions became so bad that some of the starving Japanese soldiers resorted to cannibalism of dead Australians. On 6 October 1942 elements of the American 32 Division began moving over the Kapa Kapa trail towards Buna, but the trail was so difficult that they were left in no condition to fight. On 17 October an entire regiment of 32 Division began to be airlifted from Port Moresby to Wanigela to join the offensive. The Allies would experiment with various forms of air support and air transport throughout the Kokoda campaign. Kokoda was recaptured on 2 November, and with resupply via the air strip once again possible, the Australian drive accelerated. On 10 November General Horii himself was cut off by the Australian 25 Brigade, and he drowned on about 20 November while attempting to rejoin his troops along the coast by canoe. By 19 November the Allies were closing on the Buna area.